When played on the battlefield, Sanguine Bond hurts your opponents whenever you gain life. The ability reads as the following: “Whenever you gain life, target opponent loses that much life.” Say that you have gained six points of life in one turn, you pick a target opponent and make that person lose six points of life. This effect is not optional as you read the text carefully. In short, you have to pick an opponent. Be mindful that your opponent might end up having some emblem that gives them Shroud. Due to the ability of this enchantment spell, it's best that you use Sanguine Bond in a Black and White deck or a Black and Green deck. This is due to White and Green usually having the most cards that allow you to gain points of life. That way, you gain life while you can gloat while one of your opponents ends up losing that much life. 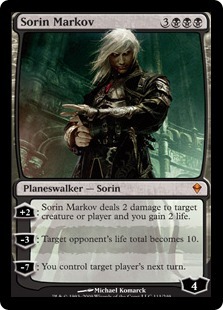 Sorin Markov, a 3 Black & 3 Colorless Planeswalker, goes good with Sanguine Bond. 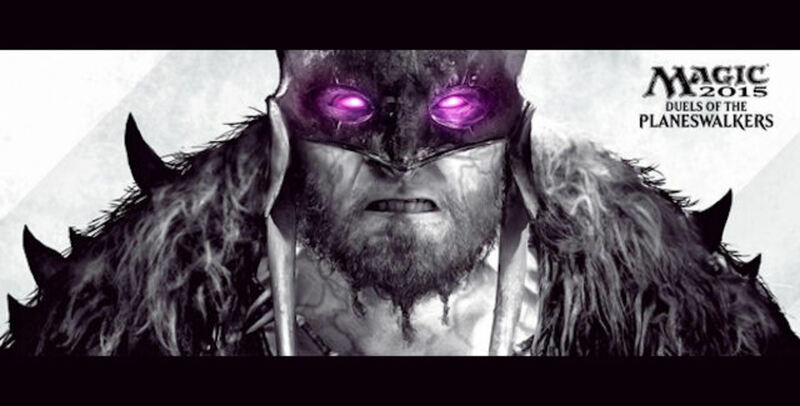 The main reason is completely due to Sorin Markov's first ability: “Sorin Markov deals 2 damage to target creature or player and you gain 2 life.” You use that ability by adding two loyalty counters onto Sorin Markov. Do this ability a couple of times, you become a thorn at your opponents' sides. If you already have Sanguine Bond on the battlefield by the time, you make a target opponent suffer up to two points of damage while you gain two points of life at the same time. With Sanguine Bond, you can make one opponent lose up to four points of life. Or, you can make two opponents lose two points of life a piece (remember, damage counts as loss of life). Each turn, you can make an opponent lose up to four points of life which can be a hindrance. 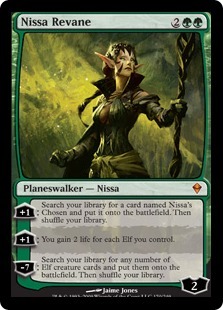 Nissa Revane, a 2 Green & 2 Colorless Planeswalker, goes good in a Black and Green elf deck solely due to the 2nd ability. The ability is as says: “You gain 2 life for each Elf you control.” By adding one Loyalty Counter to Nissa Revane, you gain two points of life for each elf on the battlefield under your control. 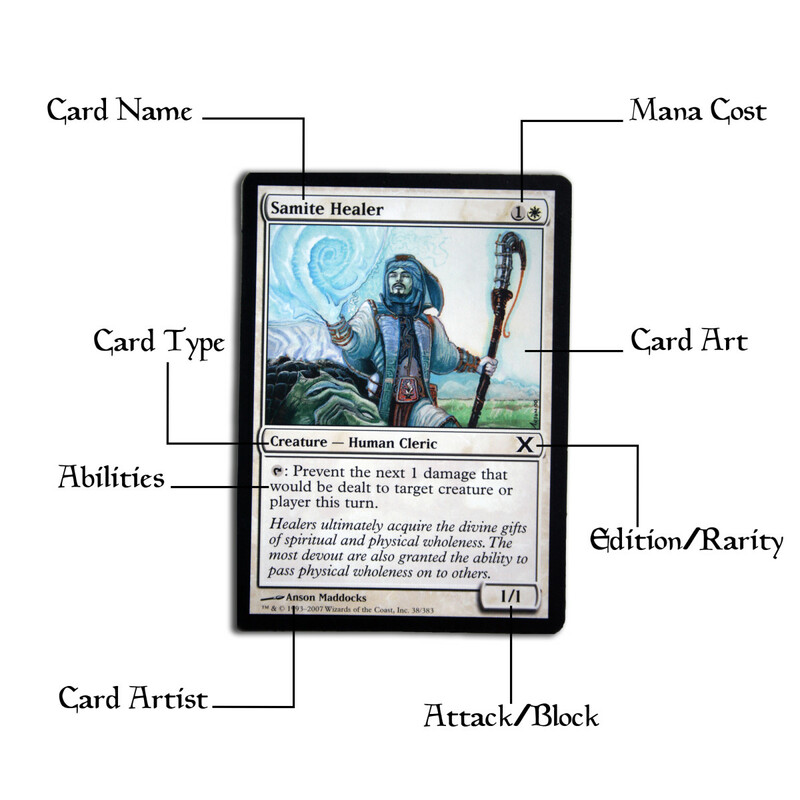 Nowadays, it's very easy to build an elf deck with the many cards available today. In EDH (Elder Dragon Highlander), you can utilize generals like Jarad, Golgari Lich Lord or Glissa, the Traitor as they are both Black and Green. Say that you have six elves on the battlefield when you utilize Nissa Revane's second ability, you would gain twelve points of life. When you trigger Sanguine Bond, you make a target opponent lose twelve points of life as a result. In a couple of turns, provided you get more elves on the battlefield, you can take an opponent out of the game. Each time you utilize Nissa Revane's second ability, provided you keep putting elves on the battlefield, you are made a serious threat. It's important that you have the means to keep cranking out elves or elf tokens onto the battlefield. Make sure you are protected as other players will bring hate in your direction. In a Black and White deck, you can substitute Nissa Revane with Ajani Goldmane. Ajani Goldmane's 1st ability allows you to gain two points of life by adding a Loyalty Counter. However, the card doesn't have the necessary life acceleration that Nissa Revane possesses. Boon Reflection, a 1 White & 4 Colorless enchantment spell, is very handy to have with Sanguine Bond in a Black and White deck. The enchantment is rather simple: “If you would gain life, you gain that much life instead.” In short, it's a life gain doubler. If you use a spell or ability that gives you four points of life, Boon Reflection doubles it to eight points of life. When combined with Sanguine Bond, Boon Reflection becomes a total bane to your opponents. If you had those two cards on the battlefield, every time you gained life would equate into every time your opponents would be at a severe disadvantage. If you ended up gaining six points of life, Boon Reflection doubles it to twelve points of life; then, through Sanguine Bond, a target opponent loses twelve points of life. If you have creatures that have Lifelink, you will do a lot of damage to your opponents by attacking with at least two or three. Make sure you have plenty of ways to gain life before you put a couple of Boon Reflection cards into your deck. Wound Reflection, a 1 Black & 5 Colorless enchantment spell, is a very devastating card to have combined with Sanguine Bond. 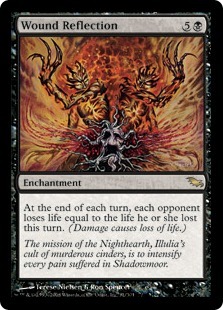 The enchantment's ability reads: “At the end of each turn, each opponent loses life equal to the life he or she lost this turn.” It adds that damage causes loss of life. If an opponent had lost ten points of life during your turn, then that opponent will end up losing an extra ten points of life at the end of the turn. Thus, the opponent loses twenty points of life. Say that you have both Sanguine Bond and Wound Reflection on the battlefield and you ended up gaining seven points of life, the former triggers making a target opponent lose that much life. At the end of your turn, the latter triggers causing that opponent to lose seven more points of life. The opponent loses a total of fourteen life points by the end of the turn. As long as you have a couple of spells or abilities that allow you to gain life points, Wound Reflection and Sanguine Bond becomes the most lethal combination in your deck. If you plan on using Sanguine Bond in your deck, consider adding Wound Reflection as well. 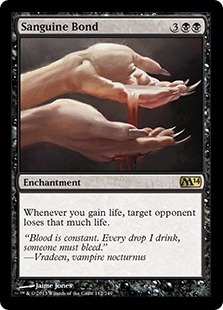 In a black Vampire deck, you need to combine Sanguine Bond with Blood Tribute (2 Black & 4 Colorless). This is a Sorcery spell which means you can only cast this during your turn. The spell is as follows: “Kicker – Tap an untapped Vampire you control.” The main ability is as follows: “Target opponent loses half his or her life rounded up. If Blood Tribute was kicked, you gain life equal to the life lost this way.” The Kicker cost is tapping an untapped Vampire that's under your control. Say that an opponent has seventeen points of life left, Blood Tribute (when Kicked) causes that person to lose eight points of life and letting you gain eight points of life in return. With Sanguine Bond on the battlefield, you end up knocking your opponent to only one point of life. If an opponent has forty points of life, the combination of Sanguine Bond and Blood Tribute will mean game over for that person. In one move, you pretty much defeated the person. The combination of those two cards would knock an opponent down more than several notches. It wouldn't matter if your opponent has two-hundred life points. With Blood Tribute, when Kicked, you'd make that person lose one-hundred life points and gain one-hundred life points. Since you gained life, that triggers Sanguine Bond. If you pick that same opponent, it's game over for him or her; or, you could “grant mercy” and use Sanguine Bond on another opponent instead. 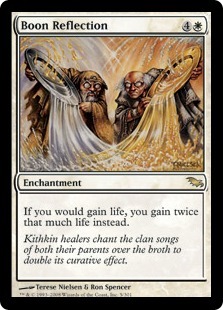 Sanguine Bond is a very decent card to have provided you have plenty of means to gain life. That alone will be more than enough to deal pain to your opponents. If you have means to make opponents lose life at the same time you are gaining life, use those cards with Sanguine Bond. In any black deck, with enough life gain spells, Sanguine Bond is invaluable. Be sure to put a few of those cards in your deck.